An anti-fracking protester caused traffic queues during a six-hour protest on the back of a lorry. The lorry involved was brought to a halt by 37-year-old Darren Dennett’s action just outside the Cuadrilla gas exploration site at Little Plumpton, where it was due to pick up a piece of machinery. 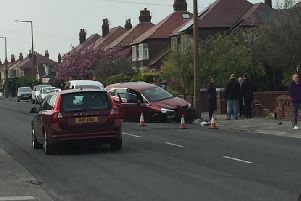 District Judge Margaret McCormack sitting at Blackpool Magistrates’ Court found Dennett, of Yew Tree Road, North Shore, guilty of tampering with the lorry on the A583. She also found him guilty of an offence under the Trade Union and Labour Relationship Act of hindering the driver in doing his job. Dennett was given a 12-month conditional discharge and ordered to pay £500 court costs and £15 victim’s surcharge. She told Dennett: “You gave your evidence passionately, but your actions were not reasonable or proportionate. Malcolm Isherwood, prosecuting, said the lorry was expected to enter the Cuadrilla site and was being escorted there by police when Dennett climbed on board. He told the judge: “The defendant got aboard the lorry and remained on top of the crane for some six hours. 21 minutes before coming down under his own volition. PC Nathan Pye told the trial that he arrested Dennett on what had been a hot June 1 day and gave him some water to drink. “He made a little speech to protesters thanking them for his support and then asked to apologise to the driver,” he said. In video footage shown at court, Dennett was heard to say he was doing his lorry protest to stop the gas company from working that day. Dennett told the court:”I do not believe what I did was ill advised. It was my only option. I am protesting to try and protect my children’s future. “I would put my life on the line for my children. “There is a school less than a mile away from this fracking pad and there is no early warning alarm system should anything go wrong with fracking– they won’t install one because it would be an admission the process is dangerous. The judge was told a traffic light controlled contraflow had to be put in place.